October 01, 2013 Culture » Big Shiny Robot! I’m online so much for work that I just naturally assume that everyone has heard of Kickstarter. But the more I talk to people, the more I realize how many aren’t quite sure what it is, what it does or how it works. And beyond that, people don’t understand that it’s a powerful tool that we can use to support our local art community. For those who aren’t aware, or have been living in a cave—Bat or otherwise—for the past four years, Kickstarter is Amazon’s crowd-funding platform. It’s where artists, writers, designers and creatives of all types pitch their proposed projects using videos and text, convincing people that they’re worthy of investment. Then we, as individuals, make the decision to put our money into the project or not. Sometimes it’s a film, and in return for our investment, we’ll get a DVD copy, or a special thanks in the credits; for books or games, we’ll get copies of them; sometimes other goodies are to be had, too. Sometimes the projects are a bit more community-oriented. Right now, the Salt Lake Film Society is running a Kickstarter campaign to make the switch to digital projection. For a $500 donation, one of the seats in the theatre will bear your name. For as little as $10, you get some freebies and their eternal gratitude. Other Kickstarter campaigns are for bits of technology for use in the nerdy world. Mimic Miniatures is a Utah-based company that will scan your head in 3-D and put it on a miniature you’d use for tabletop gaming. I bought two through Kickstarter, and I found them only because I used the website to search for local Utah projects. Sandboxr, another Salt Lake City-based company, is looking to create software that would allow you to create and upload your own 3-D character, which they’d then print as a full-color 3-D model and send to you. 5th Street Games is a company based in Salt Lake City that makes board games. 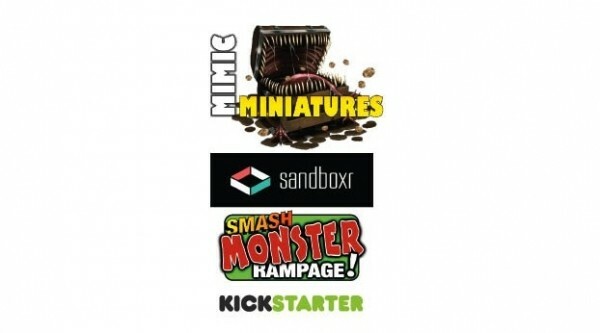 As of press time, they’ll have successfully funded their seventh board game, Smash Monster Rampage—where you’re fighting massive kaiju monsters on a city street—using Kickstarter. Even I took to Kickstarter for pre-orders of my newest book. It was a great experience, and when using it as a creator, I found other projects (including ones based here in Utah) that I wanted to put my own money into. Kickstarter is great for our creative community for a couple of reasons. For one, Kickstarter is a national (even international) platform that puts the creativity of Salt Lake City and our surrounding areas up for all to see, and it helps bring that money from all over the world to Utah to fund our arts (and geek) community. And so much of the money that comes here to local creators stays here. And, of course, every dollar you give puts these projects one step closer to success—and reality. The best part about Kickstarter is that the risks are minimal. You’re not paying for the production of a comic or a game and hoping that it becomes a hit to see a return on your investment; it’s more like you’re pre-ordering an item you wanted anyway. And if the project doesn’t meet its funding goals—which are always clearly marked—your credit card is never charged. If you don’t feel like leaving the house and visiting some of your town’s cool shops, galleries and boutiques that sell local art, comics and merchandise, Kickstarter can be a perfect way to still experience that scene and help do some real good right here in the city. Just head to Kickstarter, search for projects in Salt Lake City and go shopping. You’ll get some cool stuff and help your local art scene, all in one fell swoop.